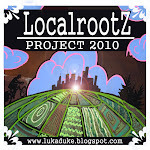 Localrootz Project: Just in Case You Missed it ! Just in Case You Missed it ! Cassi and I had an article about the LocalrootZ Project featured in last weeks Portland Press Herald. It was written by Avery Yale Kamila, and we think she did a wonderful job! We wanted to thank all the people who shared the article with facebook and twitter friends... it was kinda weird being local celebrities for a few days... but now the ink has dried and we are back on the project heading into the new year ! If you missed the article here is a LINK ! I saw it, but didn't read it at the time, so thanks for the reminder! That's a really nice profile of you two. I'm sorry I didn't see you at the Farmers' Market on Saturday- that was a good time and I'm looking forward to tomorrow's market. Happy shopping!